-Talk to our butchers about the bone! You can order your roast with or without bones. If you would like the extra flavor that the bones produce, but don't want the hassle carving around the bones, ask our butchers to cut the bones out and tie them back on. This popular option allows you too cook with the bones on the meat, then simply snip the strings after cooking, allowing the bones to fall right off the roast. Remove your roast from the refrigerator and bring to room temperature. Preheat your oven to 450 degrees. Make a spreadable paste of soft butter, garlic, rosemary, thyme, kosher salt, and pepper and spread over the top and sides of the roast. Place meat on a rack or roasting pan, fat side up, and cook for 30 minutes. Reduce the oven temperature to 350 degrees and roast until your meat thermometer reads 120 degrees for rare, 125-130 degrees for medium rare. Remove your roast from the oven, tent with aluminum foil, and let stand for 20 minutes. Cut and remove the strings on the roast. Place the bones (if your roast came with bones) on the side. Carve the meat to your desired thickness. You can cut the bones into single pieces by running a knife in between the bones. 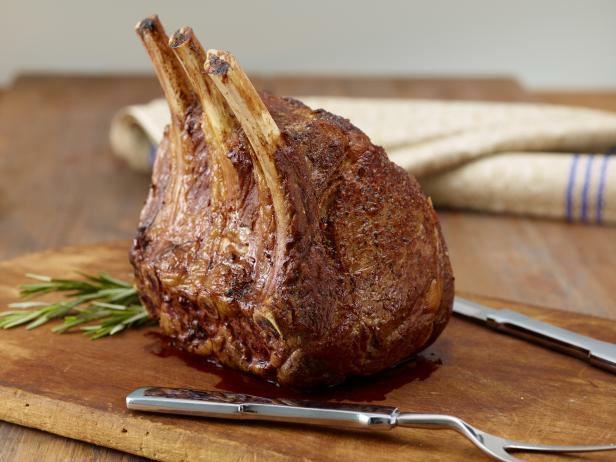 Serve your rib roast!